A cityscape view captured from a rooftop on Amoreiras Towers in Lisbon, Portugal, shows the Blue Moon rising above the city on March 31, 2018. Miguel Claro is a professional photographer, author and science communicator based in Lisbon, Portugal, who creates spectacular images of the night sky. As a European Southern Observatory photo ambassador, a member of The World At Night and the official astrophotographer of the Dark Sky Alqueva Reserve, he specializes in astronomical skyscapes that connect Earth and the night sky. 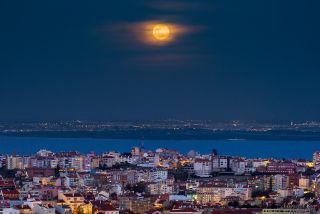 Join Miguel here as he takes us through his photograph "The Blue Moon Rising Behind a Layer of Clouds Above the City of Lisbon." A lovely cityscape view captured from a rooftop on Amoreiras Towers in Lisbon, Portugal, shows the last "Blue Moon" of 2018 rising above the city on March 31. When the moon is low on the horizon, moonlight passes through more of Earth's atmosphere before reaching our eyes than when the natural satellite is up high in the sky. That light contains a spectrum of colors, and when it travels through the particles in Earth's atmosphere, shorter wavelengths (like blue and green) bounce off those particles and scatter in all directions, while longer wavelengths (like red and orange) are more likely to pass through undeflected. The Blue Moon on March 31 was the second this year, following a rare Super Blue Blood Moon eclipse on Jan. 31. The last time two Blue Moons occurred in such quick succession was in January and March of 1999, and the sequence won't happen again until 2037. The next Blue Moon (per the monthly definition) will occur on Oct. 31, 2020. Before that, a seasonal Blue Moon will rise on May 18, 2019. The Blue Moon of March 31, 2018, rises over the Tagus River in this photo taken from a rooftop on Amoreiras Towers in Lisbon, Portugal. On the other side of the river is the Portuguese town of Samouco.